Reamaze can be configured to send directly from your own email server. By doing this, you can own the deliverability and signing of all email replies that are sent to your customers. To get started, you can enable Custom SMTP for any individual email channel under Settings > Channels. You'll need your email server hostname port domain, username, and password to authenticate. 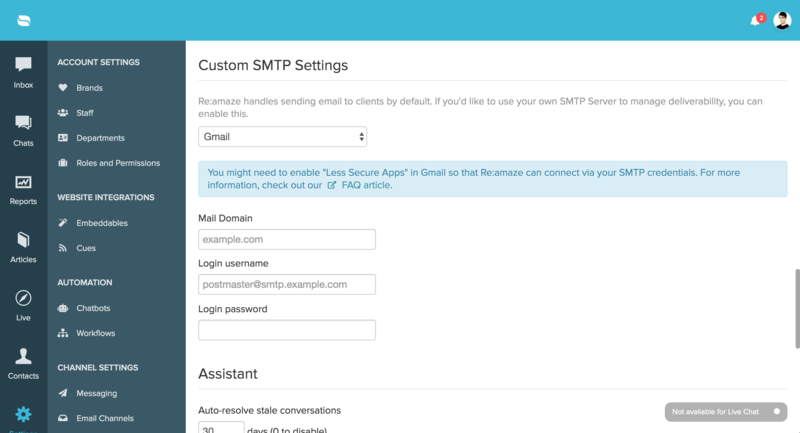 Reamaze supports SMTP over TLS if you're using a secure email server (which we highly recommend). The "via Reamaze" snippet is because of DKIM signing on our SMTP servers. Many email services will display this when Reamaze's email servers are sending emails on behalf of your domain. Enabling Custom SMTP will remove this snippet from your emails. Note that to use direct SMTP authentication on Google email services, you'll need to enable "Less Secure Apps" access so that Reamaze can connect via your SMTP credentials. Be sure to double check that you're logged in as the user you're authenticating with custom SMTP! To ensure this works properly, sign out of all other Gmail accounts while enabling "Less Secure Apps." If you want to send with a different From address than the username that you're using to authenticate into your Custom SMTP account, you'll need to make sure you have the sending emails added properly in Google Mail. By default, aliases can only receive, but cannot send. You can add a sending alias by going to Settings -> Accounts -> Send mail as -> Add another email address you own -> And then adding the email alias. 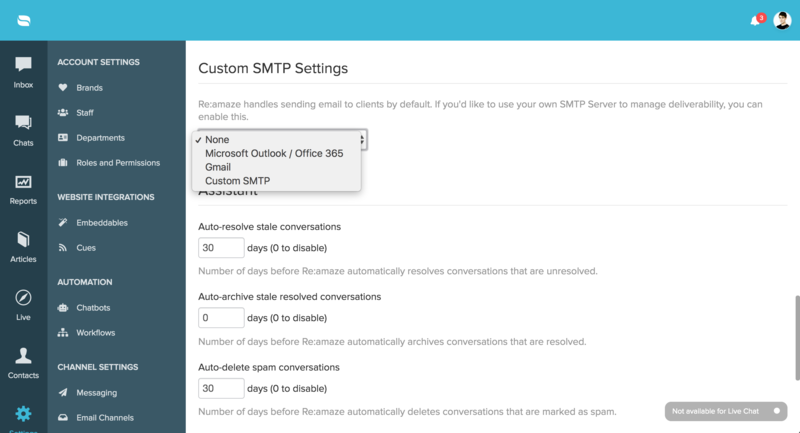 If you're using Microsoft solutions such as Outlook or Office 365, enabling Custom SMTP can be done easily after your email forwarding has been set up. 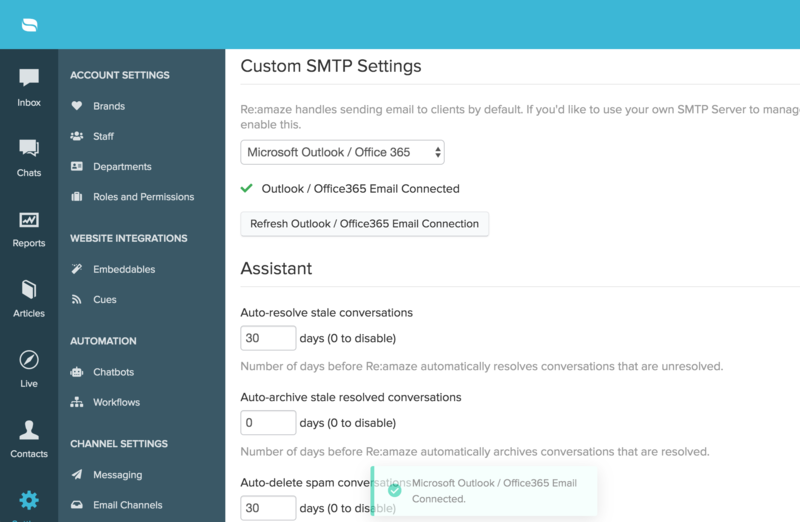 When you've completed the step above, go to Re:amaze Settings > Email Channels > Edit > Custom SMTP and enable this option. Select the Microsoft Outlook / Office 365 option and click on the "Connect" button. 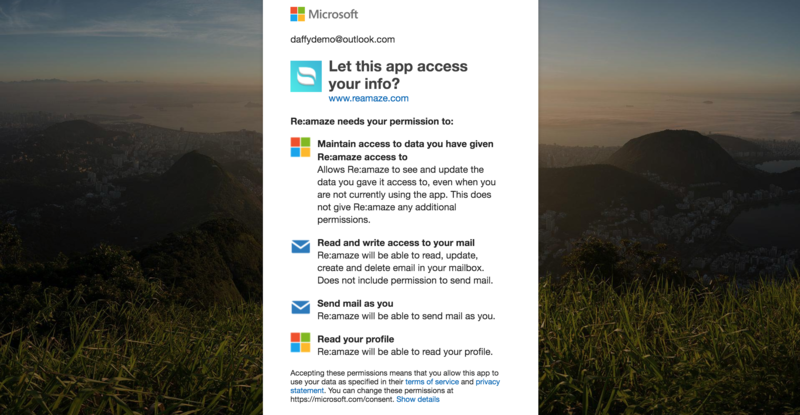 After authenticating into your Outlook or Office 365 account, make sure you accept all the permission requests posted by Re:amaze. When complete, you should see a green check mark indicating a successful connection. Enjoy!